This is me on a typical Monday morning, hand over my eyes, pretending I don’t have to get up and begin again pushing that workweek rock uphill. 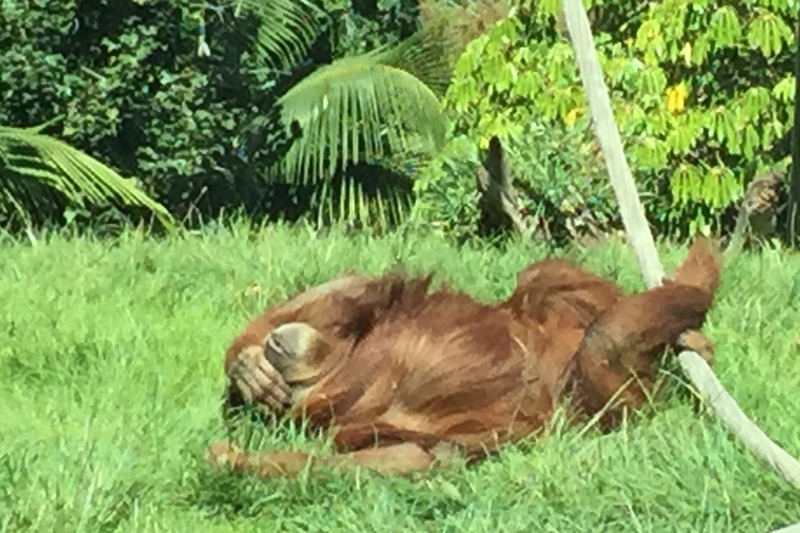 This is an orangutan I took a picture of last week when I went to the zoo again, only this zoo was the famous zoo in San Diego. Is there a more beautiful spot on the continent? It mists up at night, just enough to keep the grass green, then, and then, like in Camelot, the moisture lifts come dawn and you have a sunny day whose colors seem to come right out of an artist’s palette. They don’t though; the colors are real. Look at this view out our hotel room window; it’s looks like a watercolor, right? 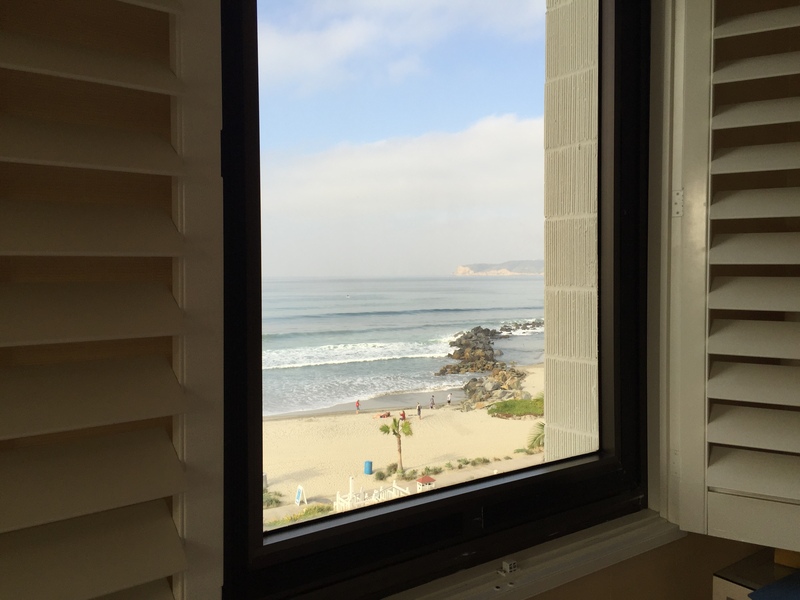 …in the Ocean Beach section of San Diego where they live, walking and eating great food at the Organic food co-op and Ranchos Cocina, and – of course! – going out onto the very long pier where people still fish for the dinner while 70 feet below crazy people in wetsuits surf the giant waves. There’s more to say about the trip, but one thing I know I ‘ll remember is how I walked down Newport Avenue in Ocean Beach and met a woman about my age with dreadlocks, who held a sign reading: “Dirty Jokes: 25 cents each.” I wish now that I’d sprung for a couple. I do admire the entrepreneurial spirit. Well more later about this Camelot. Until then let me rise up from my monkey-nap and keep on working. Just a day-and-half left to the workweek NOW!